Visiting North Wales over the Christmas week of 2016 had the potential for some great photo opportunities, but as always would be dependent on the prevailing weather! Arriving on the Friday before Christmas, the weekend looked like it was going to be very wet, and followed true to forecast! 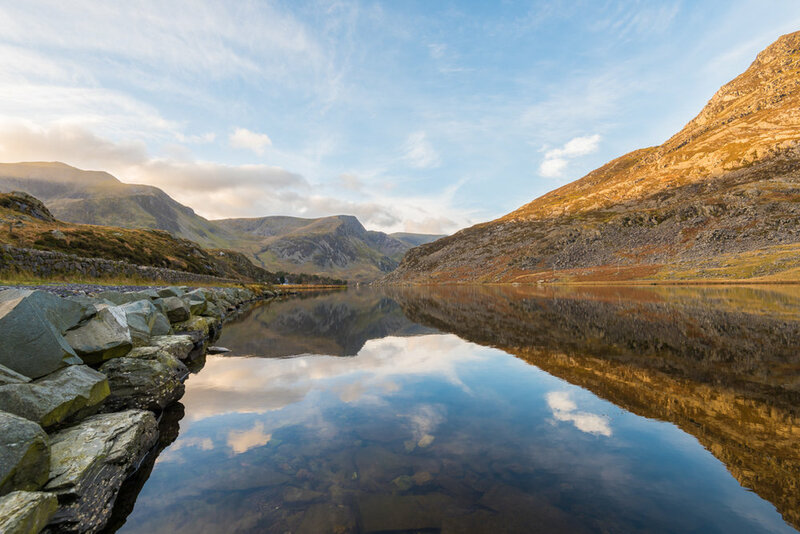 However, by Monday the weather was on the turn and some great photography outings ensued with visits to Llyn Ogwen bringing my favourite moments. 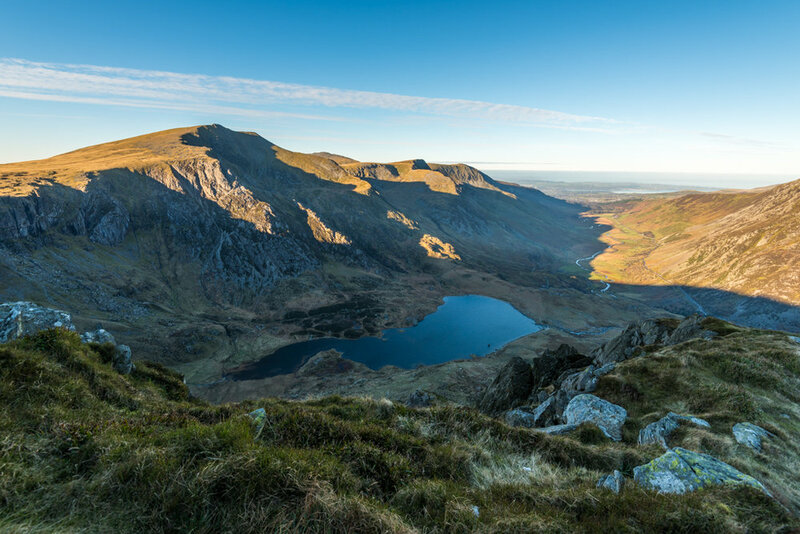 Llyn Ogwen is lake about 9km north east of Snowdon, part of a welsh valley hemmed in by Tryfan (917m), Pen yr Ole Wen (978m), Y Garn (947m), Glyder Fawr (1001m) and Glyder Fach (994m). It is a lake known for great reflection photos under the right conditions, reportedly sunset being the best timing during winter. On the Tuesday we headed there mainly as a scouting trip to judge opportunities for later in the week. 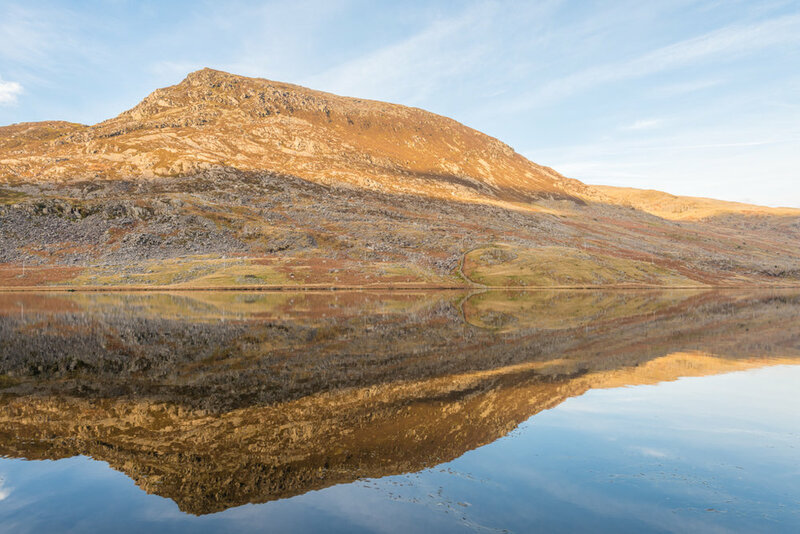 As we passed the lake, the wind was rippling the water with no sign of good reflections and so we parked up and headed up the path towards Llyn Idwal, a lake in the basin of Y Garn and Glyder Fawr. I didn't get very far, being distracted by a really pleasant waterfall under a bridge where I spent all my time as the family continued up the path. I couldn't resist the obligatory panoramic before heading back to where we were staying! We were going to be back here sooner than I expected! 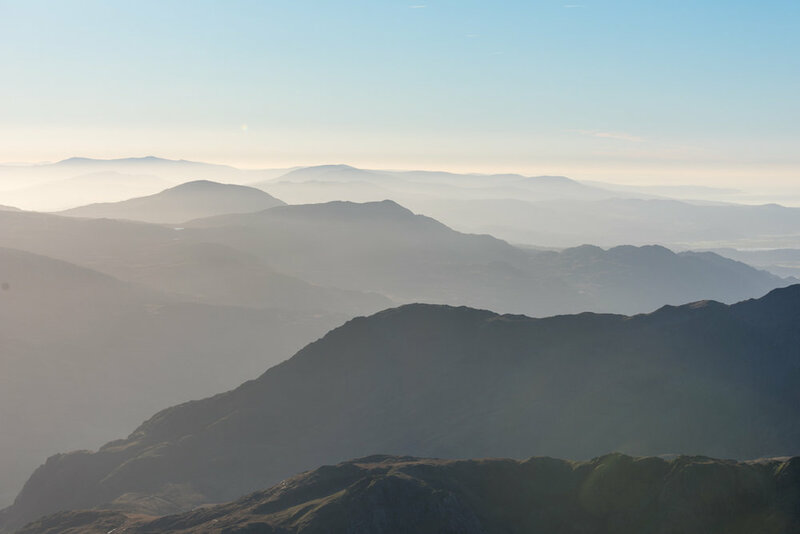 My brother was visiting North Wales that evening, with the intent of wild sleeping on top of one of the mountains, as he had seen the potential for a cloud inversion the following morning with the temperature conditions overnight. 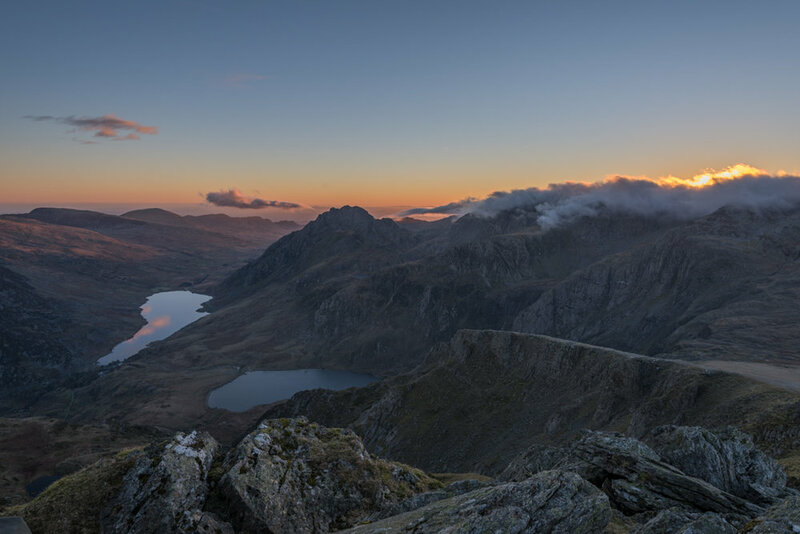 The decision was therefore made that Joshua (my son) and I would get up early and meet him at the top of Y Garn before sunrise! So leaving our accommodation before 5.30am the next morning, and well before any sign of morning light we were back to the same location. 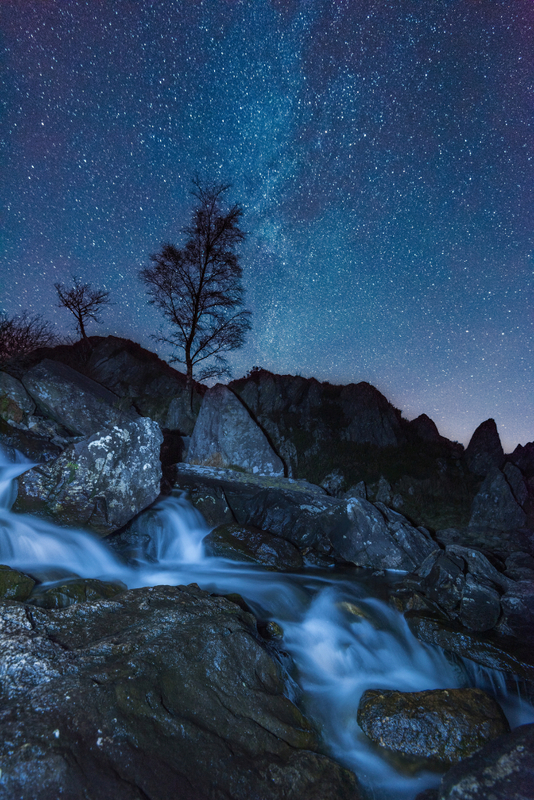 While in awe of the amazing starry night we made the gruelling walk to the top of Y Garn! My backpack loaded up with camera gear and a good sized tripod, the climb was tough and totally exhausting but ultimately well worth it! This was a shot taken about half way up after an innumerable number rock steps. We were already getting a taste of what it would be like from the top and then the pressure of getting there before sunrise kicked in! Although my legs and body were screaming to stop we pressed on, speaking to myself frequently to just keep on with one step after the next! We finally reached the top, to find my brother relaxing there in his fold up chair waiting for us!! We spent a good while at that location, taking photos, consuming food to replenish energy and hot drinks to keep us warm! The decision was then made to not return via the route up but head off towards Glyder Fawr to make a descent via Gribin. Seeing the quality of light over the mountains in the distance provided the motivation for further uphill labours, to get the shots below! Totally exhausted, we returned safely to the car, but that was not the end of the day! Heading back to our accommodation and knowing how clear the night was, a few hours later we packed up the camera stuff again and headed out to return to the small waterfall. Checking some photography apps on my phone about the Milky Way position before we left, I hoped to get some shots of the waterfall with the Milky Way behind it. It was a fitting end to a great day!